(c) UNESCO / Tourism WA. 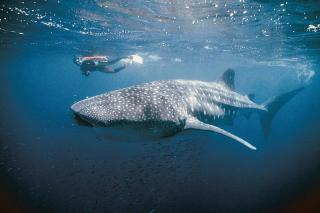 The Ningaloo Coast holds a fringing coral reef known for its seasonal feeding concentrations of the whale shark. It is located off the west coast of Australia, approximately 1200 km north of Perth. The reef is 260 km long and is Australia's largest fringing coral reef and the only large reef positioned very close to a landmass. Adjacent to Ningaloo Reef, the limestone karst landscape of Cape Range has a remarkable density of more than 500 caves and other karst features, supporting globally outstanding fauna. Nigaloo has some of the best scuba diving in the world, along with the nearby Navy pier. I actually prefer it to the Great Barrier Reef, as you don't need long boat rides, and can dive right off shore if you want. Its really common to take road trips up the coast from Perth with a camper van, and you can camp anywhere on great beaches near the road. Besides diving, they also offer whale shark tours where a small plane flies over head searching for the sharks so that you don't have to search all day by boat. Awesome place. This site is located in the remote north-west corner of Western Australia where it rarely rains, and the scrub hardly grows more than knee high, so provides no natural shade from the rays of the sun. In April,when it was a balmy 39degC and the flies were in abundance, I drove from Exmouth along the bitumen to its end at Yardie Creek. From here southwards 4WD vehicles are mandatory. The drive was 170 kms each way, and there are numerous beaches where stops can be made to inspect the reef and its occupants. For variety along the way there is the Milyering Information Centre providing a wealth of information about the denizens of the deep. Also there is the Vlamingh Head lighthouse, sited on the highest promontory, and overlooking the graves of the many ships that fell afoul of the reef before the lighthouse was constructed. 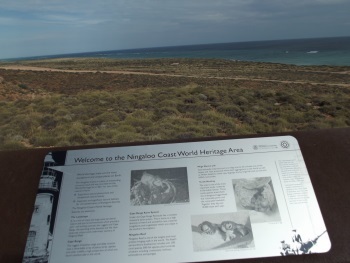 I visited Ningaloo reef in 2005. It was beautiful and one of a kind. It should make the list just for the "Ayers rock" brain coral. But its also in the path of migratory animals like dolphins, manta rays, humpback whales, and dugongs. Then there are the whale sharks that pass through. Then there is the bush surrounding the area that lends its own beauty with wildflowers, termite mounds, and the occasional gorge.